Welcome to the Waffle Flower September New Release Blog Hop! I have so many projects using these new products to show you, but first let's take a look at everything Waffle Flower is releasing! 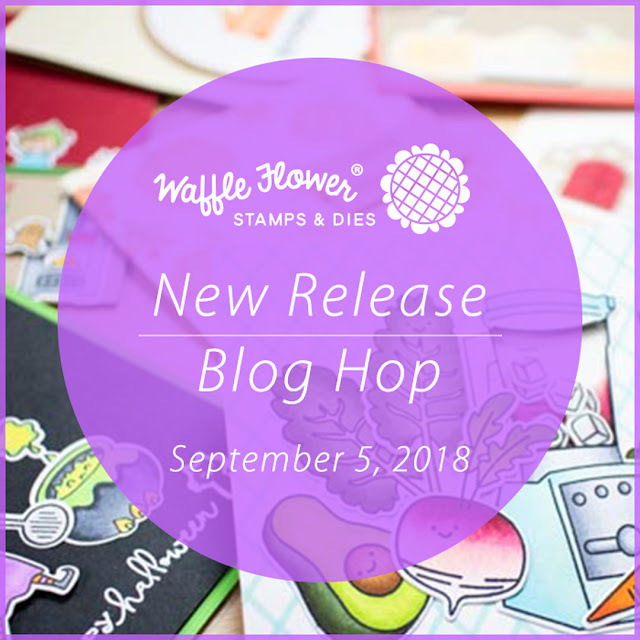 In Waffle Flower’s September release, you will find the highly requested Color Swatches for Inkpads (stamp) that includes everything you need to swatch out your stamping inks. For those of you who are already thinking about Holiday cards, you will find the cutest witch in Hocus Pocus (stamp, die, combo) to help you cast your spell around Halloween; the most adorable pumpkins in Stitched Harvest (stamp, die, combo) to help you get the cross-stitched look without a needle or thread; you will also find Cookie Time (stamp, die, combo) that highlights the popular cookie baking and exchange activities around the holiday season along with the precious Gingerbread House Die to complete your tags or cards! 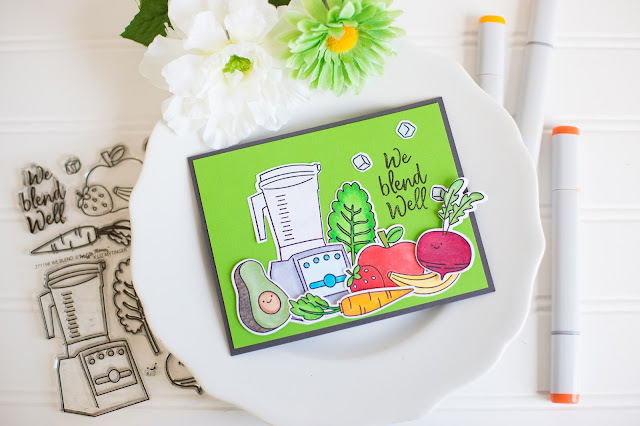 Since we are on the topic of food, you will also find the sweetest confections in Sweet Treats (stamp, die, combo) and the cutest veggies in We Blend (stamp, die, combo). 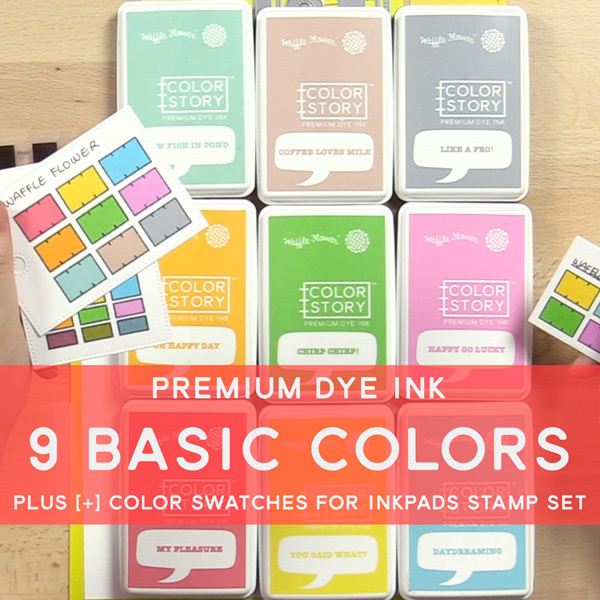 While we are at it, if you grab 9 basic ink colors as a bundle, you will get a FREE Color Swatches for Inkpads Stamp Set! Also use code “LastChance” for 25% off all inks including this bundle. Ok, let me show you some of the projects I created for this release. 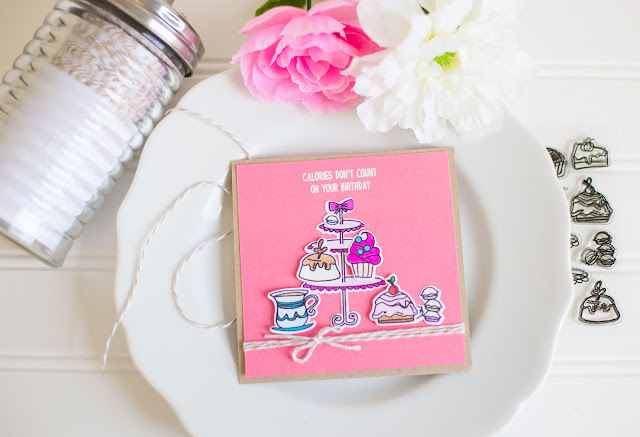 First up, here's a little square card that I made with the Sweet Treats Stamp set, Matching Dies and Combo. I colored and cut all the cupcakes, cookies and goodies and then had fun arranging them on the tiered treat tray. 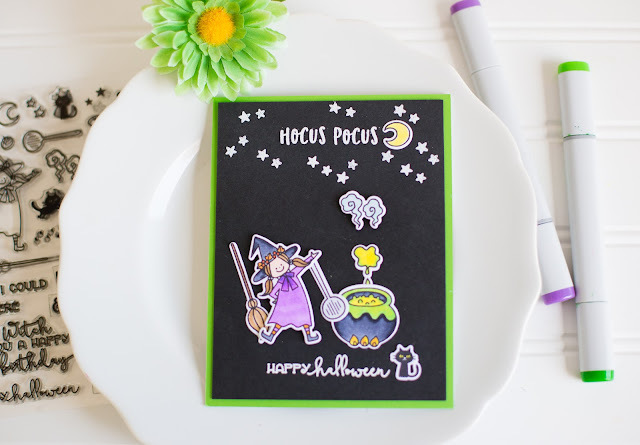 Next up is the Stitched Harvest Stamp set, Matching Dies and Combo. 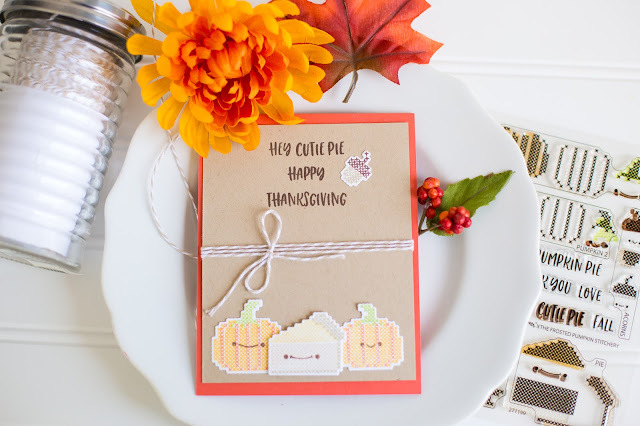 I love getting the look of cross stitching by simple stamping! I love the little smiley faces that you can put on the pumpkins, pie and acorns. 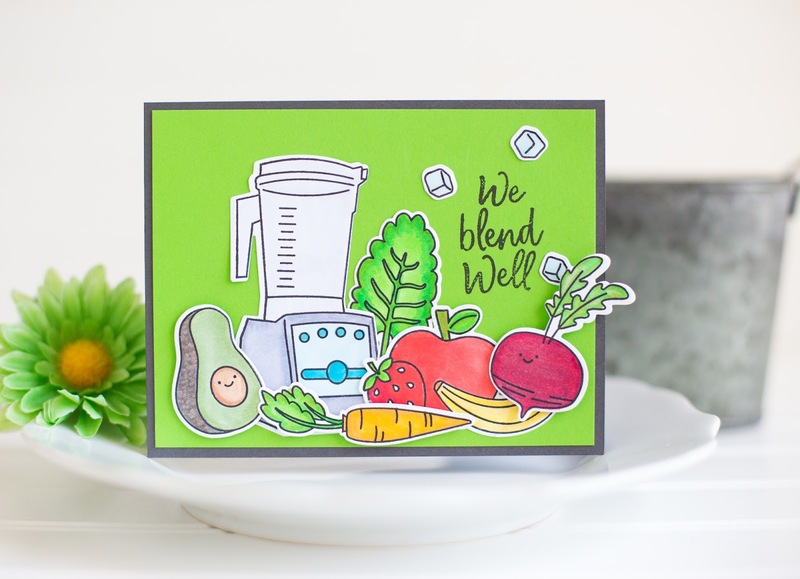 I created this card with the We Blend Stamp set, Matching Dies and Combo. I had so much fun Copic coloring the fruits and veggies and arranging them near the blender. I used a Copic Colorless blender to create the mottled look of the avocado skin and I added some Tonic Studios Nuvo Crystal Glaze to the ice cubes for some shine. I am super excited that Halloween is coming! 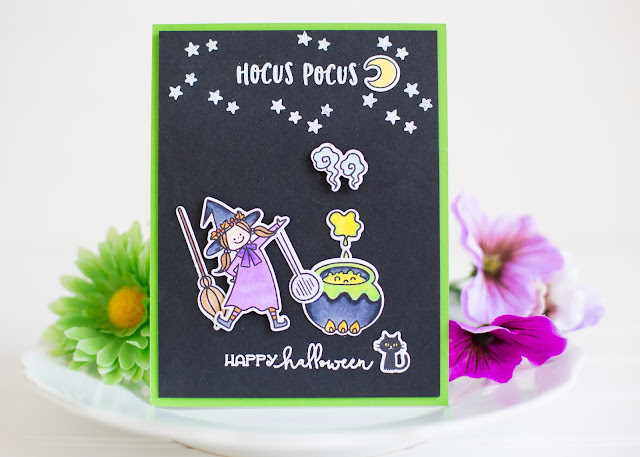 I used the Hocus Pocus Stamp set, Matching Dies and Combo to create this Halloween scene. I love how the matching dies help cut out so many tiny images from the stamp set, like that little cat. I have NO patience for fussy cutting lol! Moving right along to Christmas! Truly the only time I bake cookies is at the holidays, so I fell in love with the Cookie Time Stamp Set, Matching Dies and Combo! I love both the full images and the ones that are designed to look like they are at a counter top. So cute! And, last but not least, the Gingerbread House die! You get the basic house, a layer of snow, the chimney and door as well as house front to customize your house in any colors you want! The house fits perfectly on a gift tag! I also created a tow of gingerbread houses for this layout! You can check out the entire release bundle HERE. Ok! 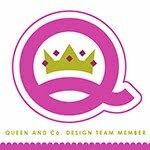 Now that you've seen some projects created with this release, let's talk about the details of this blog hop! To celebrate the blog hop, Waffle Flower is giving away $25 gift certificates to THREE lucky winners. You can leave comment on my blog and along the hop by 11:59pm ET on 9/10/18 for your chance to win. Winners will be chosen at random from the comments left on any of the posts on this blog hop and will be announced on the Waffle Flower blog on 9/12/2018. To celebrate the new release, all orders placed by 11:59pm ET on 9/10/18 will receive a mysterious gift! Limited 1 per customer; while supplies last. Be sure to leave comments for everyone to have the most chances to win! Each one of these fun creations are quite inspiring. Wish I could get them all! Love this fun release and the great inspiration! Great cards!! Your gingerbread layout is so cute! Wonderful cards. I love the beautiful ink colors and the Halloween set is so fun. this is a fabulous release and your cards are inspiring, for sure! 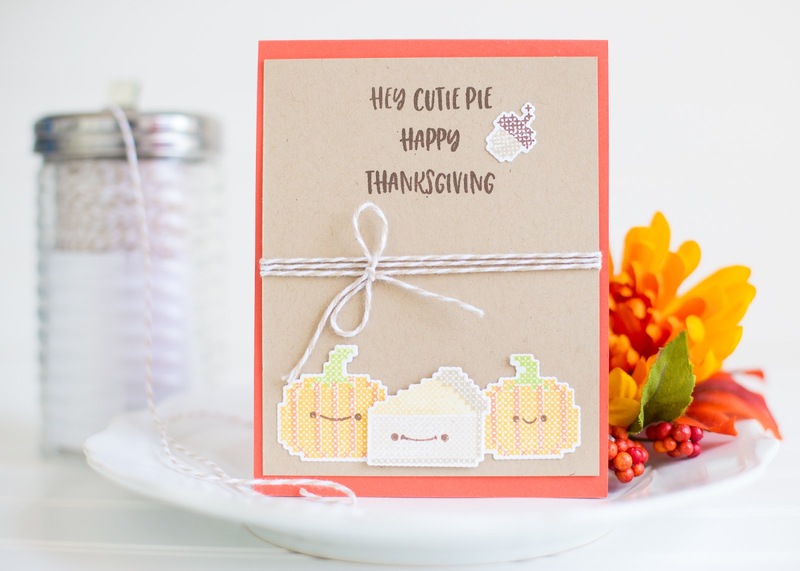 Adorable cards...especially love the row of gingerbread houses! 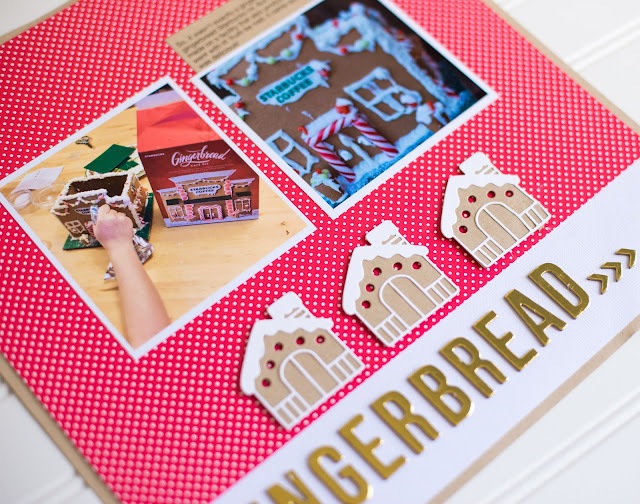 Love how you used those little gingerbread houses on a scrapbook layout, need to do that more! Wonderful cards! In love with the blend together set. Your cards are so super cute! I love your layouts - so clean and well laid out so showcase the cute stamps. Your cards are all lovely! What a fun release and what fun your cards are! That Cookie Time set tho', that's a must have for sure. Thanks for sharing and the inspiration! 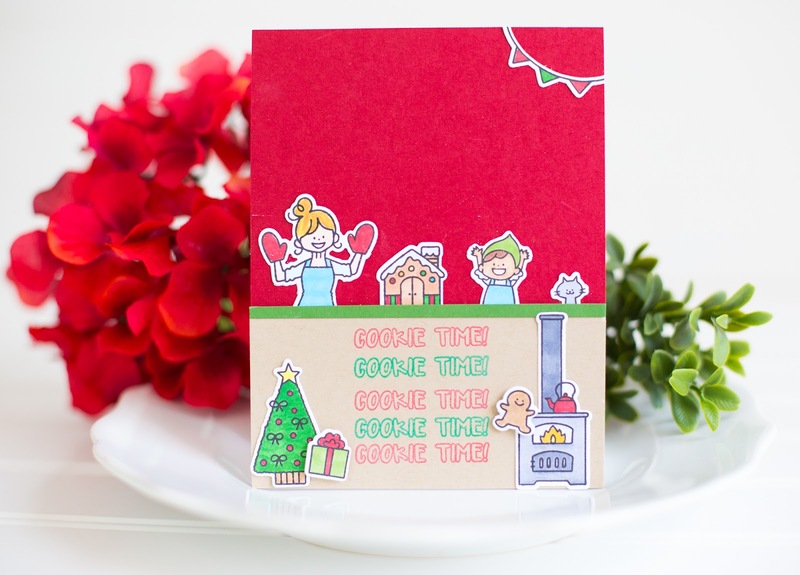 So many fabulous cards and I love how you used the gingerbread houses on your layout! My favourite card is the Cookie Time one! Or maybe Sweet Treats! I loved all your cards. Thank you for sharing such cute ideas. Everything is so bright and colorful! I love your cards and the scrapbook layout is fab. The gingerbread house is adorable! I wouldn't have thought to use it on a gift tag. Thanks for sharing your ideas. I love the bright colored backgrounds you made! Such adorable cards! Great coloring and scenes! 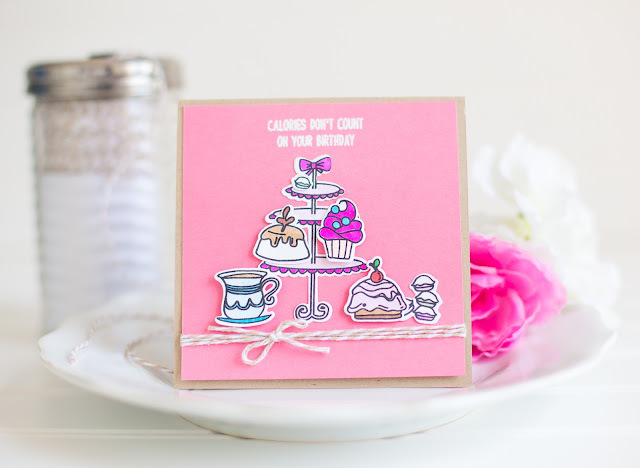 Gorgeous cards - love that sweet treats set! I like your wonderful variety of projects. Your cards are all so creative! Cute projects! Love the tag and page layout with the gingerbread houses! I bake a lot of cookies at Christmas and those tags would be perfect for gifting a plate of goodies. Thanks for the inspiration! 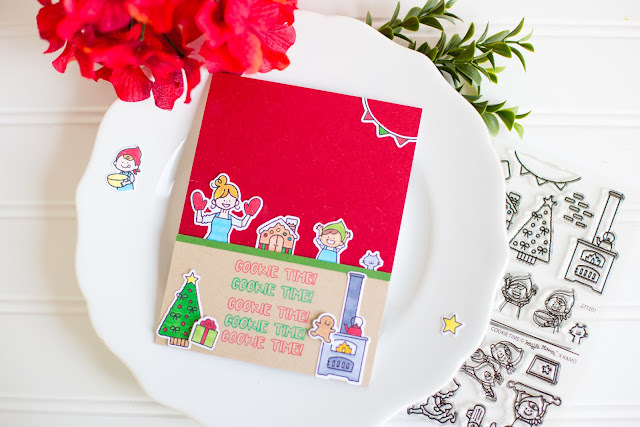 I really like "stitched" stamp set <3 I'm also have some ideas for the gingerbread house. Thanks for all the ideas for all these new release! Gorgeous set of cards!!! They're all so cute!!! All of your cards are so cute!! I really like the layout you created, so fun. The Hocus Pocus set is my favorite. Fabulous creations! I really love the witch stamp set and card you made. Love the fonts within it as well! Adorable cards. The stitched harvest card is my favorite. Yep..I'm already smitten with everything! What wonderful cards - love them all! GORGEOUS and adorable cards! You were really busy! Hard to decide a favorite but I think I will go with the Desserts one on the top! So very elegant and pretty and girly too! I love all these fun, seasonal cards! I can't decide which new set is my favorite. These are all so sweet. I really enjoy how you arrange all your elements on your cards; there's something that feels very CAS even when you have many images on a card. Thanks for sharing all these amazing projects with us! Super sweet and fun projects! Such fabulous and creative use of the new products. So many great projects! Love the variety of them and how you used all these wonderful products! I love all of the baking stamped images!! I need them. The pumpkins are adorable!!! Delightful cards with these fun stamps and dies! 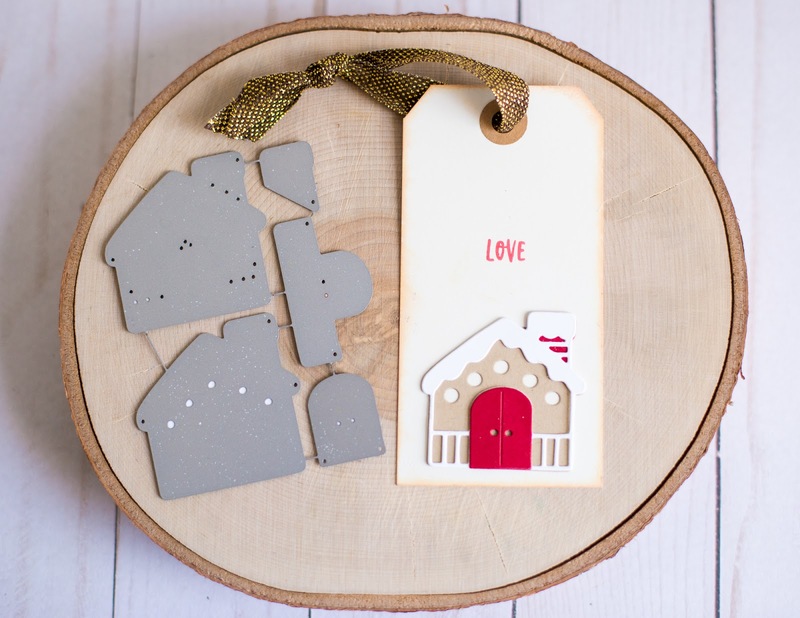 I especially love the cute gingerbread house die set... so fun! The Stitched Harvest set is awesome too! Oh, these are all so adorable!!! I love the fun sentiments with these sets! So fun!